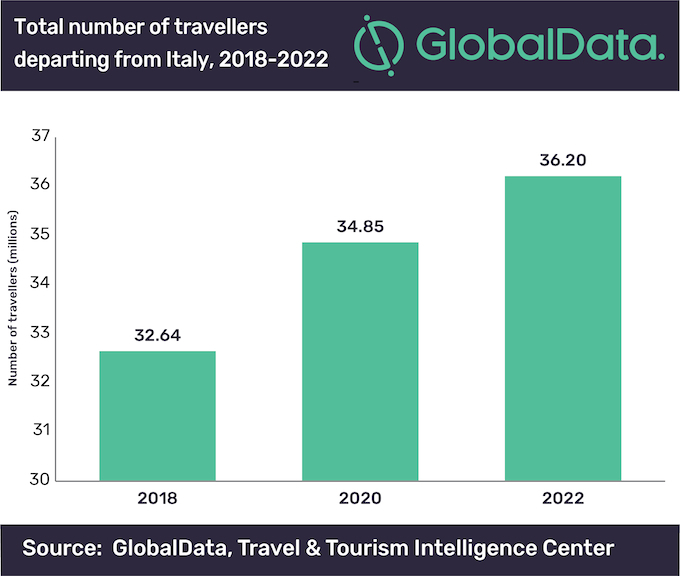 The number of outbound travellers departing from Italy is set to increase at a compound annual growth rate (CAGR) of 2.6% from 32.6 million travellers in 2018 to 36.2 million in 2022, according to GlobalData, a leading data and analytics company. The company’s latest report: ‘Tourism Source Market Insight: Italy’ reveals that the factors influencing this increase include a rise in income for younger travellers, the increase of low cost airlines reducing travel costs and an overwhelming interest for travel and different experiences. The two main factors that impact Italian travellers decision making when booking holidays are: affordability and accessibility, which have both been boosted by competition within the airline industry. Johanna Bonhill-Smith, Travel & Tourism Analyst at GlobalData, said: “A growing interest in exploration and the search for different cultural experiences within younger generations has further boosted outbound tourism. Internal domestic trips are forecast to decline during 2020 to 2022 despite being nearly double the amount of arrivals for the past decade. This is potentially due to issues such as ‘overtourism’ in the country’s tourism hotspots, causing Italian travellers to venture abroad rather than remain in their home country. “Domestic trips are gradually decreasing as younger travellers aspire to explore different cultures and have authentic experiences,” added Bonhill-Smith.